T-R PHOTO BY THORN COMPTON - Marshalltown freshman Phoebe Hermanson, center, makes her way along the course at Marshalltown Community College during the Marshalltown Early Bird Invitational on Thursday. Hermanson was the top Bobcat placer, taking 13th in the meet. T-R PHOTO BY THORN COMPTON – Grundy Center/Gladbrook-Reinbeck senior Derek Ciddio leads a pack of runners through a downhill portion of the Marshalltown Early Bird Invitational on Thursday. Ciddio finished fifth in the race. T-R PHOTO BY THORN COMPTON – Grundy Center/Gladbrook-Reinbeck senior Lily Ehlers, right, crosses through a stretch of the course at Marshalltown Community College during the Marshalltown Early Bird Invitational on Thursday. PHOTO BY TROY HYDE/NEWTON DAILY NEWS – GMG’s Jackson Edens runs to first place at the Collins-Maxwell Invitational on Thursday at Center Grove Orchard in Cambridge. T-R PHOTO BY THORN COMPTON – Marshalltown freshman Phoebe Hermanson, center, makes her way along the course at Marshalltown Community College during the Marshalltown Early Bird Invitational on Thursday. Hermanson was the top Bobcat placer, taking 13th in the meet. T-R PHOTO BY THORN COMPTON – Marshalltown freshman Conner Smith, right, runs alongside a competitor from Southeast Polk during the Marshalltown Early Bird Invitational at the Marshalltown Community College course on Thursday. Smith paced the Bobcats on the day, placing 15th in his first varsity meet. her first day of high school and her first varsity cross country meet. Make that three firsts actually, since Hermanson excelled in her first race on the varsity level to pace all Bobcat girls with a solid time of 22 minutes, 12 seconds, to place 13th at the 10th annual Marshalltown Early Bird Invitational on the course at Marshalltown Community College. 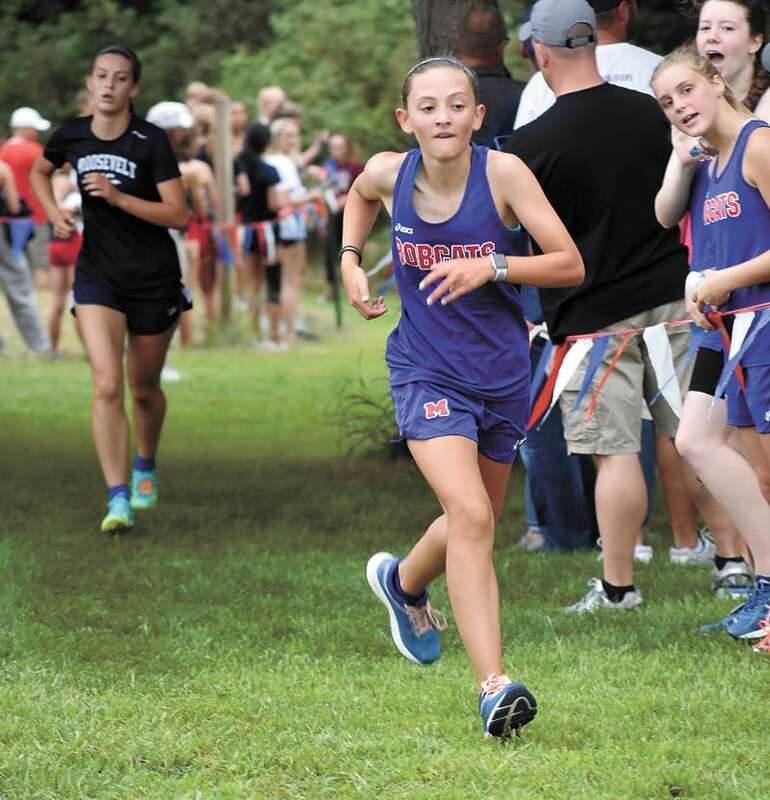 MHS head coach Stacy O’Hare said she wasn’t sure what to expect out of the talented freshman harrier in her first high school race. 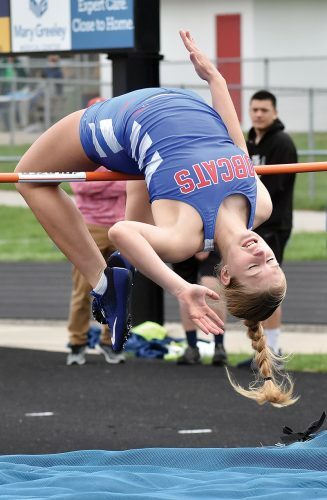 Hermanson admitted she was feeling the butterflies in her stomach before the meet started, but after watching the junior varsity races before hers started she settled down. T-R PHOTO BY THORN COMPTON - Grundy Center/Gladbrook-Reinbeck senior Lily Ehlers, right, crosses through a stretch of the course at Marshalltown Community College during the Marshalltown Early Bird Invitational on Thursday. “That always happens for me in the races, it felt pretty good when I got going,” she said. Hermanson was only beat by runners from three different schools — Des Moines Roosevelt, Ottumwa, Urbandale and South Tama County — and she was the second-highest placing freshman behind Urbandale’s Erin Van Quathem, who took 11th. After the strong time to start the year, Hermanson said she’s not settling with where she currently is. “I definitely am looking to improve, but for the first meet I am satisfied with [my time],” she said. It wasn’t just Hermanson who showed well, however, as Marshalltown placed fifth as a team with a score of 128. 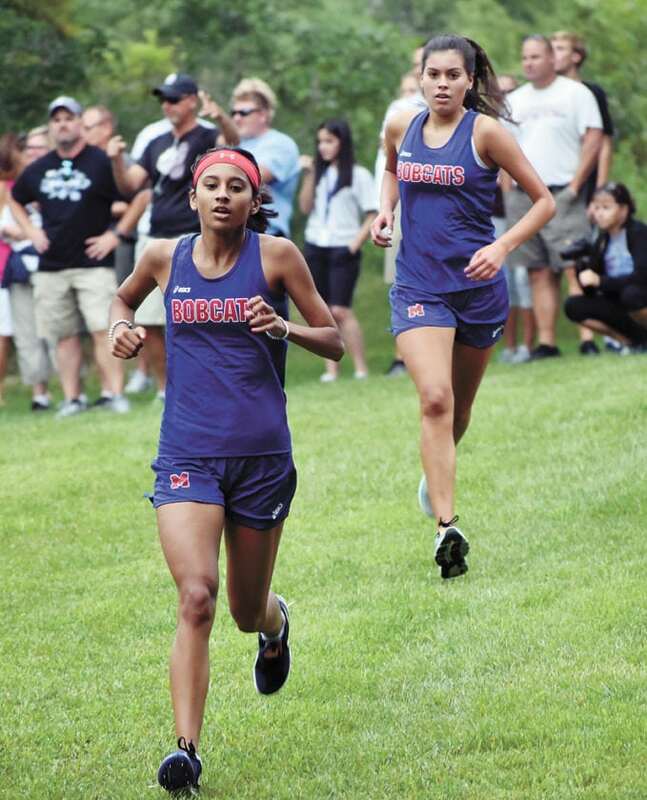 Junior Mia Barajas was the next-best finisher, placing 26th with a time of 24:08, and sophomore Odaly Flores followed just behind in 28th with a 24:39. Both Barajas and Flores improved their times from this meet last season by at least 11 seconds. Mary Kate Gruening was next on the list, placing 32nd with a 24:47, and Jade Tejada finished fifth on the team and 33rd overall with a 24:48. No matter the sport or how many times you’ve competed in it, the first meet, game, or match of a season can fray the nerves, but O’Hare said her girls handled it well. Also having such a strong showing from a newcomer like Hermanson is a little added motivation for the other girls, especially the older runners on the team. The highest area finisher at the Early Bird was South Tama County senior Callie Frakes, who was the top local placer for the second-straight year. Frakes placed 12th with a time of 22:07, about 15 seconds off her pace from last year, but head coach Robert Tyynissmaa said what he is most encouraged about is Frakes’ health, given she had her season derailed last year with some nagging leg injuries. Aside from Frakes, nearly every Trojan runner on Thursday was new to the course. Freshman Jojo Tyynissmaa was the next-highest placer, coming in 31st with a 24:46, while sophomore Alyssa Chyma placed 43rd with a 25:30, sophomore Abbagail Froelich took 57th with a 27:46 and junior Makayla Backen came in 61st with a 28:42. 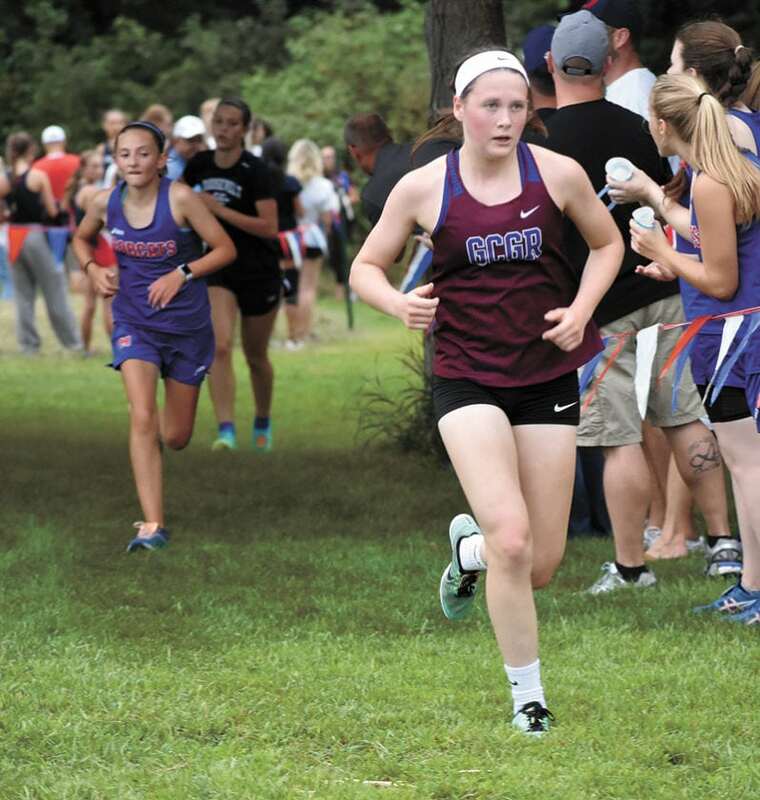 Grundy Center/Gladbrook-Reinbeck senior Lily Ehlers began her final year as a Spartan harrier with another top-20 finish, taking 19th with a time of 22:51. 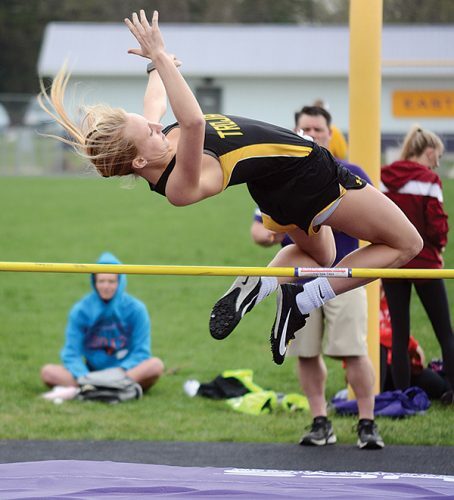 Ehlers was one of two state qualifiers for GC/G-R last season, along with fellow senior Reegan Zinkula, and new Spartan head coach Jackson Anderson said she has been great so far not only as an athlete, but as a leader. Finishing just four seconds behind Ehlers in 20th was freshman Taylor Stahl, who completed her first varsity race in 22:55. Zinkula wasn’t far behind, placing 22nd with a 23:13, and Cora Saak also placed in the top-25, coming in 24th with a 23:36. Anderson said having four of his girls all finish almost with 30 seconds of each other shows the competition on the team and their want to be present as a Spartan squad at the state meet in Fort Dodge. 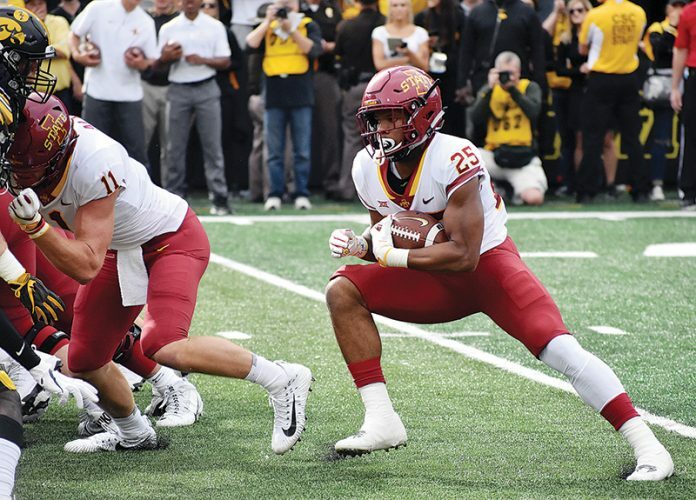 “We are setting goals as a team and they know where they want to be come October, so I think all of our girls have worked harder in the first two weeks than they have in years past just because they know they are capable of it and want to do everything in their power to make it back to Dodge,” he said. Team Standings — 1. Des Moines Roosevelt 34, 2. Urbandale 41, 3. Ottumwa 85, 4. Grundy Center/Gladbrook-Reinbeck 115, 5. Marshalltown 128, 6. Waterloo East/West 157, 7. South Tama 192, 8. Belle Plaine 225, 9. Webster City 240. Individual (top 10) — 1. Macy Gaskill, URB, 20:18; 2. Alli Bookin-Nosbisch, OTT, 20:27; 3. Megan Fleming, DMR, 20:30; 4. Carrolin Mellin, OTT, 20:39; 5. Sarah Fleming, DMR, 21:08; 6. Kayla Owens, URB, 21:08; 7. Clara Colvig, DMR, 21:15; 8. Abby Huls, URB, 21:16; 9. Anna Gilbreath, DMR, 21:35; 10. Gabi Hoard, DMR, 21:38. GRUNDY CENTER/GLADBROOK-REINBECK (115) — 19. Lily Ehlers 22:51, 20. Taylor Stahl 22:55, 22. Reegan Zinkula 23:13, 24. Cora Saak 23:36, 35. Shelby Rivera 23:36, 43. Sarah Lindeman 25:37, 59. Lauren Wegmann 27:52. MARSHALLTOWN (128) — 13. Phoebe Hermanson 22:12, 26. Mia Barajas 24:08, 27. Odaly Flores 24:39, 32. Mary Kate Gruening 24:47, 33. Jade Tejada 24:48, 56. Tana Underhill 27:44, 63. Taylor Hoffman 29:31. SOUTH TAMA COUNTY (192) — 12. Callie Frakes 22:07, 31. Jojo Tyynismaa 24:46; 43. Alyssa Chyma 25:30; 57. Abbagail Froelich 27:46; 61. Makayla Backen 28:42, 64. Neena Lasley 30:09.